No one is ever going to complain about receiving free spins and they are always a very welcome feature in any slot game you play. There are plenty of slots that have this bonus feature and they really do give you a great chance of getting some big wins. It’s usually the scatter symbol in the game that plays a major part in your triggering the free spins bonus feature. Keep an eye out for that symbol and start counting because three or more are the general qualification needed to get those much appreciated free spins. But there are some exceptions to the rule. The free spins is simply how it sounds. You get some spins and instead of choosing a stake, they don’t cost you a penny. The free spins that you get are at the same level of bet you had in the spin that triggered them. However they are a bit more complex than that because other features can also get a look in. Sticky Wilds are often included and there’s also the possibility that all the wins you get in a free spins bonus round will be subject to a multiplier. For example in the Barcrest slot ‘Curse of Frankenstein’, three of the symbol featuring the Hammer Films logo gets you into the free spins round. Three is the bare minimum but as is the case in many a slot game, the more triggers you get the better your time in the free spins round might be. In this game the more scatters triggering the bonus, the higher the multiplier in the round. In ‘Dr Love On Vacation’ (NextGen), three scatters get you 12 free spins, four give you 16 and five award you 20 with all wins tripled. Wins being multiplied during the free spins is quite common..It’s little things like that which can make a free spins round really profitable. Even better is if you can actually re-trigger the free spins during the actual round. You can in ‘Curse of Frankenstein” and could even end up with 255 free spins if your luck is really in. Still on the horror theme there’s also the ‘Ooh Aah Dracula’ slot from Barcrest where free spins are a major part of the game. In this game there’s an added dimension to the free spins with the wild symbol playing a big part. Rather than just being given a straight number of free spins, there are two rounds, one of 15 and another with 10 and with one wild symbol in round one and two in the second. But after the first set of free spins you can take your money and run and if carrying on only receive the winnings from the second round. So as you can see free spins often have some company that can make getting winning combinations even more likely. Thankfully not all free spins rounds get as complicated as that one. In the NextGen game ‘Eastern Dragon’ it’s actually the wild symbol that has the job of triggering the free spins. Also from the same company is ‘Dolphin Reef’ and this only gives you five free spins but an expanding wild, another example of some cream on the top to increase your chances of winning. Sometimes you have a big decision to make before starting a free spins round. 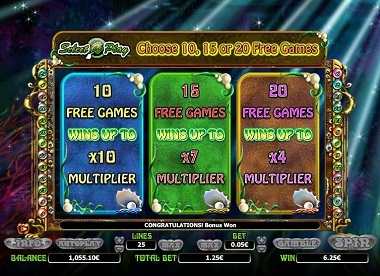 In ‘Enchanted Mermaid’ (NextGen) you can choose between ten, 15 and 20 free spins but with varying levels of multipliers. You’re choosing the volatility you want for your free spins round and it’s sometimes best to plump for the middle option unless you’re in a real daring mood. Always have a good look through the paytable whatever game you’re playing. That’s where you’ll find out if there are any free spins available in the game and if so, the conditions that are applied to them. Free spins really can be the main feature of a game, it’s where the big profits lie.